Hunyadi Mátyás was born 23 February 1443, and became king of Hungary in a process that began in 1458 and was completed in 1464 when he was crowned with the Saint Crown of Frederick III. He was a strong king and favored ordinary citizens over the nobility. He valued the arts and sciences and created the Bibliotheca Corviniana, a great library in Buda in 1471. He was known as Matthias Corvinus because of the raven on his coat-of-arms. He died 5 April 1490. 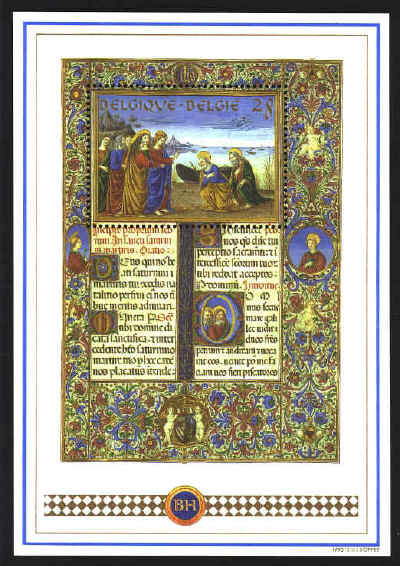 The souvenir sheet shows a page from the Missale Romanum of Matthias Corvinus.